A highly practical, introductory level sports coaching qualification. The course introduces pupils to the basic principles of coaching and provides learners with the skills and principles required to safely deliver sports coaching sessions. In this course pupils study four units. Explore what it means to be a sports coach and get the background you need to participate in coaching activities. Understand the role of the coach in the planning, implementing, analysing and revising of coaching sessions. Identify a range of methods of developing learning, performance and the effective management of participant behaviour. 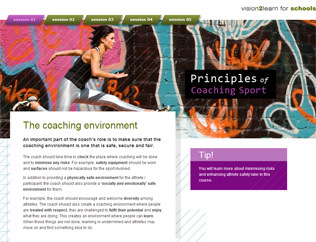 This unit assesses the coach’s understanding of the principles of planning, delivering and evaluating coaching sessions, which improve participant(s)’ performance in sport. Learn about the lifestyle factors of nutrition, physical conditioning, mental preparation and awareness of drugs, which underpin performance in sport. Discover the key safety aspects you need to consider and ensure that your coaching is safe and equitable (fair).